Where else would you find a kayaking outfitter sharing space with a winery? Those who think the Olympic Peninsula in Washington State is the land of perpetual mist should think again: in terms of natural beauty, sunshine, and food it's more like an undiscovered Provence. Sequim, Port Angeles, and many of the loveliest attractions of Olympic National Park lie in the mountains' rain shadow, which means nearly nonstop sunshine in the summer and fall, and plenty of sunny days in the spring and winter. Yes, the scenery is spectacular, and the hiking, kayaking, skiing, swimming, mountain biking, fishing, and surfing are some of the best in the world, but the real attraction is the food and wine. Everyone knows us for wild salmon, steelhead, Dungeness crab, and oysters, but the Olympic Peninsula also offers wineries, extraordinary fruits and vegetables, wild mushrooms, nuts, and artisanal cheeses. The Dungeness Valley is an agritourism Brigadoon. 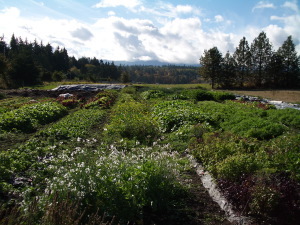 The finest vegetables in the world are grown here by a group of dedicated farmers led by Nash Huber, the grand old man of Washington organic farming. Stop by Nash's farmstand and pick up carrots so sweet kids will eat them like candy. Visit Christy Johnson's farm, and join her as she walks out to the fields and picks your baby pea shoots. In June and July you can pick your own strawberries and raspberries. If you have horrible school day memories of kale as the antiChrist of greens, prepare to be astonished. This stuff is sweet and nutty; deep fry it in olive oil, and you'll prefer it to french fries. And we've Got Milk! The incomparable Dungeness Valley Creamery sells raw Jersey milk that tastes like ice cream. Local cheese makers, Port Townsend Creamery, turn it into glorious cheeses. So rent a cottage with a kitchen, hit the wineries - don't miss Harbinger Winery next door to Adventures Through Kayaking, - and stock up at the farms. Then get into Olympic National Park and build up an appetite. Provence never had it so good.